Experience our true Canadian winter while staying fit and making new friends. 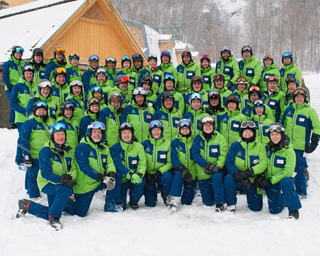 Our team of 80 certified instructors is trained to help you learn and develop your skills in downhill or cross-country snow sports. Once you join High Park Ski Club, all on-snow classes are free and unlimited! Better still, classes are small so you can get the attention you need to improve and feel more confident on the snow. Whether you are a beginner, an intermediate, or an expert, there is a class for you on any day trip! Not sure of your level? An instructor will assess your level before the lessons start. Certified instructors will also guide you through the big mountains and trails on overnight bus trips. Yes, you can improve your skills in downhill skiing, cross-country skiing, or snowboarding while travelling with your club friends in Ontario, Québec, Vermont, and beyond! Check out our three ski school programs - downhill skiing, cross-country skiing and snowboarding. Need more encouragement? Don't just take our word for how great our lessons are, here’s what our members say about our lessons…. "After casually snowboarding for about ten years, I was getting frustrated because my skills were not improving. HPSC helped me rediscover the joy of snowboarding by teaching me new skills in a comfortable and non-judgmental environment. The friendly instructors made it easy for me to refine my technique and enabled me to attain my level 1 CASI certification."